* From inspirational ballads to up-tempo rock styles, these are the hits to play in 2013! 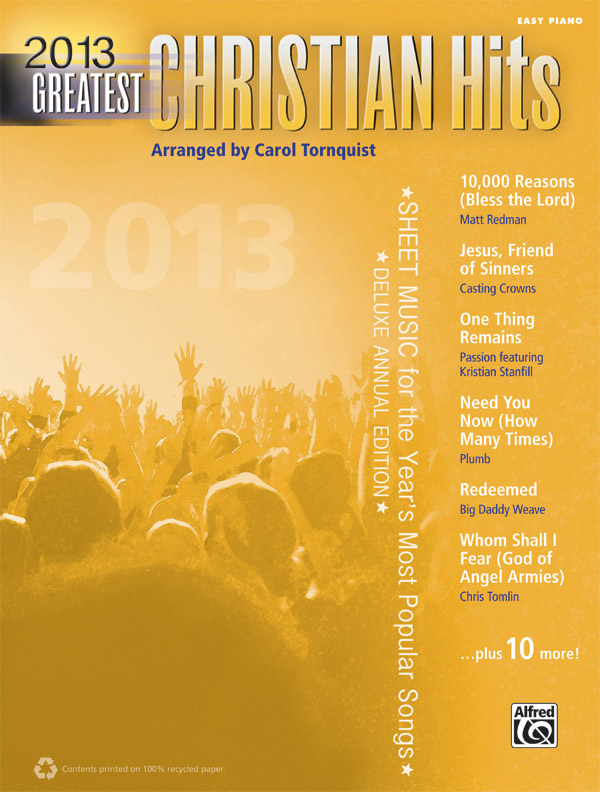 * Play and sing the music of today's top Christian artists with easy piano arrangements of 16 hit songs. * Due to their popularity and playability on piano, they rank among the top-selling sheet music titles in their genre. * For practice, performance, and expression of faith through music, this collection guarantees unlimited enjoyment. * Titles: 10,000 Reasons (Bless the Lord) (Matt Redman), God's Not Dead (Like a Lion) (Newsboys), Good Morning (Mandisa), Hold Me (Jamie Grace featuring TobyMac), How Great Is Our God (Chris Tomlin), I Need a Miracle (Third Day), Jesus, Friend of Sinners (Casting Crowns), Need You Now (How Many Times) (Plumb), One Thing Remains (Passion featuring Kristian Stanfill), The Proof of Your Love (For King & Country), Redeemed (Big Daddy Weave), We Are (Kari Jobe), Who You Are (Unspoken), Whom Shall I Fear (God of Angel Armies) (Chris Tomlin), You Are (Colton Dixon), Your Love Never Fails (Newsboys).